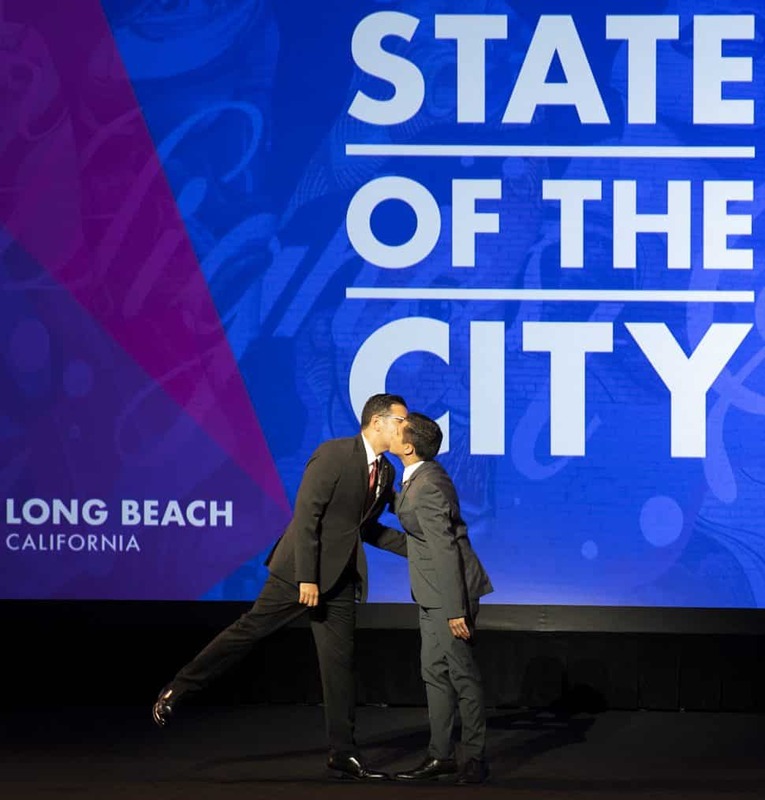 Mayor Robert Garcia’s “State of the City” opened, and closed, Tuesday night, Jan. 15 at the Terrace Theater, leaving in its wake facts, choreography and applause; some of it voluntary. For those unaware, mayors often give annual “State of the City” addresses—their purpose self-explanatory—and while others may choose to do this in an overtly political setting, say, city council chambers, Garcia chose to do it at the lovely and massive Terrace Theater, a questionable choice given that only three-quarters of the theater’s orchestra level was filled. Audience members were prohibited from sitting in the higher levels, at least that was the feeling one got from the phalanx of armed police officers blocking the stairs. The crowd size may have had something to do with the scheduled 6 p.m. curtain, or the fact that many people don’t consider it an evening’s entertainment to hear the mayor discuss regulatory policies and crime rate figures—oh, you don’t know this mayor. 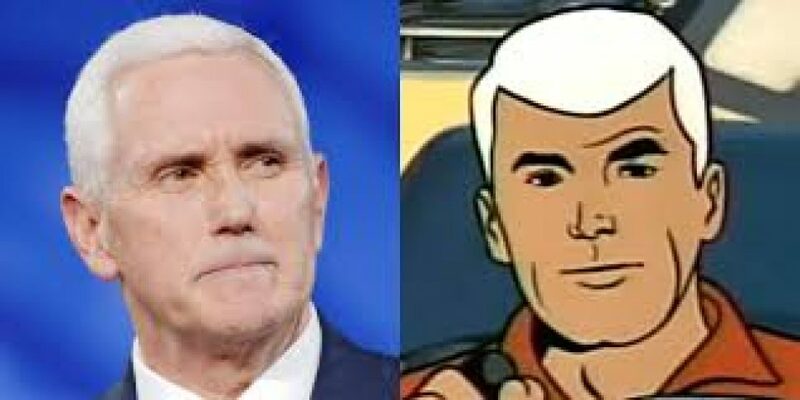 All of this ignores the fact that politics and show business have always borrowed from each other, one need only look at Ronald Reagan, Arnold Schwarzenegger or Mike Pence—the original Race Bannon from “Jonny Quest”—as examples. Those who attended the talk were immediately confronted by the telltale signs of show business, whether it was the beckoning spotlights out front or the half-hearted hugs and room-scanning “I’m-talking-to-you-only-until-I-find-someone-more-advantageous-to-my-career” conversations in the lobby. “Breathe” is about community, so one could see why it was chosen, then again, when Olivio punched out the phrase “Hey guys, it’s me! The biggest disappointment” you had to wonder if anyone had bothered to read the lyrics. 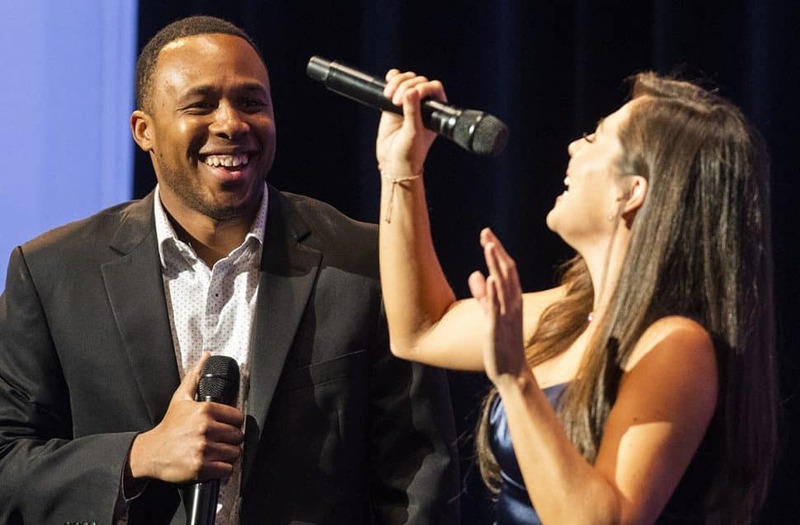 Olivio was then joined on stage, of the State of the City address, by Carleton Bluford and they performed, with choreography, “Benny’s Dispatch”—a song about traffic. Disappointment. Traffic. State of the city. The singers were great, as were the kids who led the crowd in the pledge of allegiance, then Vice Mayor Dee Andrews introduced the main act, Mayor Robert Garcia. Matt: Hi. Wow – there are a lot of people! Mayor: I know. How do you think it’s going so far? Matt: The singers were great! I love “In the Heights”! Mayor: Well it’s one of our favorite musicals. You have any advice for me? Matt: Just be yourself and have fun! Mayor: OK. Love you and see you after the speech! Matt: OK. See you soon! Political theater is often hard to watch. Who can forget the horror of Tipper and Al Gore’s spastic facial jiu jitsu of a kiss on stage of the 2000 Democratic National Convention or the many and feeble attempts of the President of the United States’ to hold his wife’s hand. Still, while anyone witnessing Long Beach’s first couple engaging in typical “banter” on stage would recognize it as two exits past stilted, it must be said that the fault did not lie totally with the couple saying the lines but the lines themselves, which Meryl Streep, Robert DeNiro or John Gielgud’s ghost could not have breathed life into. For one thing, the lines lack credibility. For instance, the line “You have any advice for me?” is something longtime couples would never say to each other, as it would establish a dangerous precedent. And the line “see you after the speech!” not only never comes up for people, it is followed by an exclamation point as are six of the eight scripted lines are, giving the whole thing a falsely heightened sense of excitement. After bidding his husband farewell, Garcia began his speech, and this is where things settled into something much more recognizable. Garcia talking about his administration’s accomplishments, employing a TED Talk-type of stage movement—two steps to left, gesture with left hand, four steps to right, gesture with right hand, quick glance teleprompter, execute planned ad-lib. Almost immediately, he began to employ what would become his talk’s through-line; not necessarily a theme but a direction: “Let’s give a big round of applause to/for…” Garcia would barely get through a couple of sentences without asking for applause. At first, it was what you’d expect. Applause for teachers, applause for first responders. But as the speech went on, and on, he was asking, demanding, more applause for not only individuals but concepts and statistics, all of it peaking when the crowd was directed to applaud for ballot measures and water rates. Low water rates! In fact, when the speech was over—“Good night and Go Long Beach!”—it was interesting to realize that about the only two times people did not have to be directed to applaud was when Vice Mayor Dee Andrews mentioned that former Mayor Beverly O’Neill was in the house and when Garcia highlighted the fact that the local prosecutor would be expunging marijuana convictions from people’s records. In politics and in show business, you gotta give the people what they want!